Settling in for the quiet summer before ramping up for training camp in less than a month, teams are readying to set their sights on the intense ‘Road to Super Bowl 53’ in Atlanta in 2019. 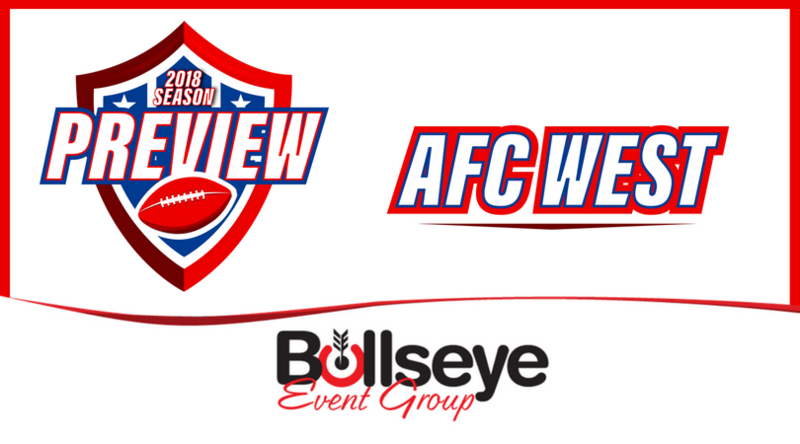 Next up in our divisional previews is the always competitive and parity-driven AFC West. Normally, you wouldn’t expect a team that got out to a 5-0 start on the 2017 NFL season and had an MVP-caliber quarterback at the helm to make too many changes. The 2017 AFC West champion Kansas City Chiefs, however, are an exception to that rule. After finishing the season at 10-6, the Chiefs decided it was time to shake things up. The team shipped quarterback Alex Smith to the Washington Redskins in exchange for defensive back Kendall Fuller and a draft pick, opening the door for now-sophomore quarterback Patrick Mahomes to take the reins. And it wasn’t just the quarterbacking position that saw a dramatic makeover. The Chiefs also added two of the biggest prizes of the 2018 free agency period in wide receiver Sammy Watkins and linebacker Anthony Hitchens as well. One of the more mediocre teams of the 2017 NFL season, the LA Chargers finished their first season back in the city of angels at just two games over .500, and followed it up with a relatively quiet offseason. Getting a steal in rookie safety Derwin James out of Florida State with the #17 overall pick in the 2018 NFL Draft was what could be considered the highlight of the transactional period. Aside from James, the team was able to help fortify their offensive line by bringing in former Pro Bowl center Mike Pouncey, as well as a new target for quarterback Philip Rivers in tight end Virgil Green. After a disappointing 6-10 campaign, just a year removed from winning the AFC West and being a top-tier team in the AFC, the Raiders decided to shake things up when it came to the coaching staff. Enter; former Raiders head coach (and Super Bowl champion) Jon Gruden. While many thought the Raiders would have an ‘all-out’ approach to free agency and the draft thanks to the returned presence of Gruden, that wasn’t the case for the Raiders. The Raiders weren’t short on moves, but it was the lack of ‘star power’ that surprised many. The team drafted offensive lineman Kolton Miller out of UCLA with their first-round pick, and brought in solid position players such as Rashaan Melvin (DB), Doug Martin (RB), Martavis Bryant (WR), Reggie Nelson (S) and their prized pickup, Jordy Nelson (WR). An offseason of turmoil and speculation followed the Broncos after their disappointing 5-11 campaign in 2017. Following the retirement of quarterback Peyton Manning, the team has struggled to provide an offensive presence at the quarterback position… something the Broncos believe they have solved in the 2018 offseason. The Broncos signed former Minnesota Vikings quarterback (and 2017 standout) Case Keenum to take the reins as the team’s new quarterback. Keenum helped lead the Vikings to a 13-3 record and the #2 seed in the NFC, featuring an NFC Championship loss to the eventual-Super Bowl champion Philadelphia Eagles. Aside from Keenum, Broncos fans are feeling optimistic, as the team was also able to grab arguably the best player in the 2018 NFL Draft in edge rusher Bradley Chubb, pairing him alongside the already-daunting Von Miller.